It's Leopard day. I am really excited to get home to install the new version of OS X. It isn't actually the new operating system itself that excites me, it is the new applications that I know have been waiting for this release to be able to see the light of day. Our own Google Mac team has announced an update for Leopard, so update Google Desktop before you change your strips for spots. When you setup the new Mail.app, consider enabling IMAP in Gmail and using both (I have been looking forward to IMAP support for a long time)! 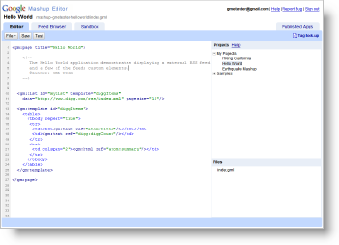 If you want to test GData endpoints, there is help for doing some testing with cURL which we documented for you. We got to hear to some of the teams too. Bruce Johnson and Joel Webber, members of the Google Web Toolkit team, had a nice interview with Pearson before the upcoming conference on GWT. Paul McDonald and Rich Burdon of the Google Mashup Editor Team also discussed the nuances of the GME product and where it is heading. In the Google Maps world Pamela played with clickable Polygons and used the ability to play a game. Also, if you are a Flash-y kind of guy, you can do more with KML and Flash. For those that like to search across open source code, we have a new ability to tell us more about your code via the integration of Google Code Search and Sitemaps. I am now heading out to get Leopard roaring, but a couple of final points. 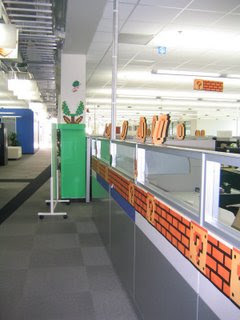 The new Google Finance Gadgets are interesting, and take a look at how our developer team lives in a Mario World. Registration for the Pearson conference is still open, but be sure to register before October 27th (this Saturday) to receive the early bird pricing discount. You can review the complete list of sessions and speakers on the conference website. When we met Sebas at the Ubuntu Developer Summit last November, he thought the digs were pretty cool and he asked if Google would be willing to host a release party for KDE's upcoming 4.0 launch. Since Sebas seemed like such a nice chap and we love hosting open sourcerers, we said "Hey, why not?" While the KDE development team has been hard at work preparing Betas, we've been collaborating with the project's outreach team on details for the release party. 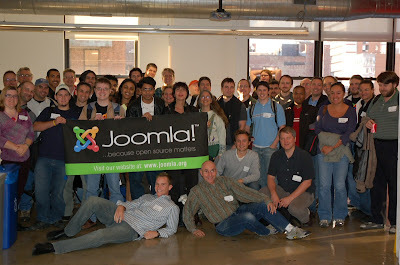 The release party, along with typical conference activities like presentations and BoFs, will be rockin' at Google Corporate Headquarters January 17-19, 2008. If you're looking for more information on the event, check out Troy Unrau's blog. Rumor has it that that KDE e.V., the non-profit organization behind the KDE project, will even fly one lucky KDE community member out for the release party. Pamela also worked on Blog.gears, a Blogger client that works offline using Google Gears. She took some time to take a peak at the architecture behind the application, and then walked us through the application itself. 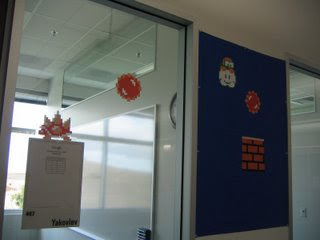 I think we all remember the 8-bit awesome that was classic Super Mario Brothers. 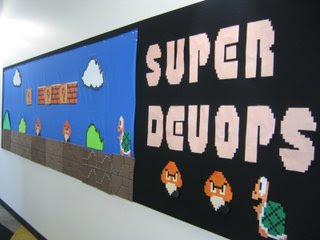 Most of us in Developer Ops have spent many hours immersed in the pixelated world of question marks, mushrooms, coins, and Koopas. 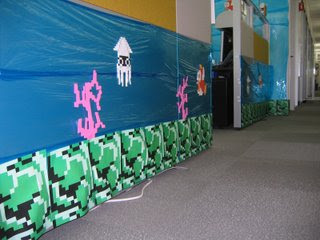 So, when the cube decorating contest (the theme was 'Games') was announced, the course of action seemed obvious. I recruited a few lieutenants and we had some brainstorming sessions -- complete with design docs sketched out on a whiteboard. There would be two main areas - the classic Level 1 terrain and an underwater level. We took on this task with typical Google vigor -- 15 yards of blue cloth, 5 rolls of saran wrap, 10 pieces of posterboard, foam, lots of color printer toner, and a few afterwork hours/weekends later, here are some of the results. They say that a good work environment increases productivity. Where better to seek inspiration than the hardest working plumber ever? P.S. In case you were wondering, we came in 2nd to Analytics (their theme was Jumanji). They had a motion sensor box that triggered a tiger roar when you walked by though. It was pretty cool. We've heard from a number of site owners who want to make sure their public source code is searchable via Google Code Search. To help with that, we extended the Sitemap Protocol to support code files. This makes it possible to specify all the code files on your site, as well as the programming language and software license for each file. Once you've created your Sitemap, post it to a public URL on your site and then be sure to submit it through Google Webmaster Tools. We hope this effort will help make even more code accessible and useful for developers. Let us know what you think. 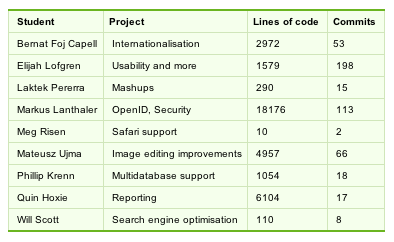 There's still a lot more code out there, so we'll keep working on improving Google Code Search as a tool for finding it. I had the pleasure to head to my home town (London, England) to participate in the Future of Web Apps conference that brought together an interesting set of developers who want to take a glimpse at the future.... and the present. I gave a presentation at the conference on Google Gears that covered all of the core components (Database, LocalServer, WorkerPool) and also showed off some of the great work that the community has been working on (libraries that work on top of the APIs, great examples, etc). I really enjoyed the many questions that I got at the end of the talk, and through out the conference. Being in Europe, it was very interesting to see many questions on mobile Gears. The questions came in from app developers, mobile phone vendors, and phone networks alike. It seems that it is a common wish to have the offline abilities on their phones. I quickly realized why this was the case from the Londoners.... the tube! They need to put network repeaters in the tube, but since they have found it impossible to get air conditioning down there, I doubt that will happen any time soon! I also got to talk to developers about architecture practices around the applications that they are taking offline. As always, it was interesting to talk to developers working with this in the real world. The Gears project is run very much in the open, so take a peak at the Google Group for Gears and join the fun. 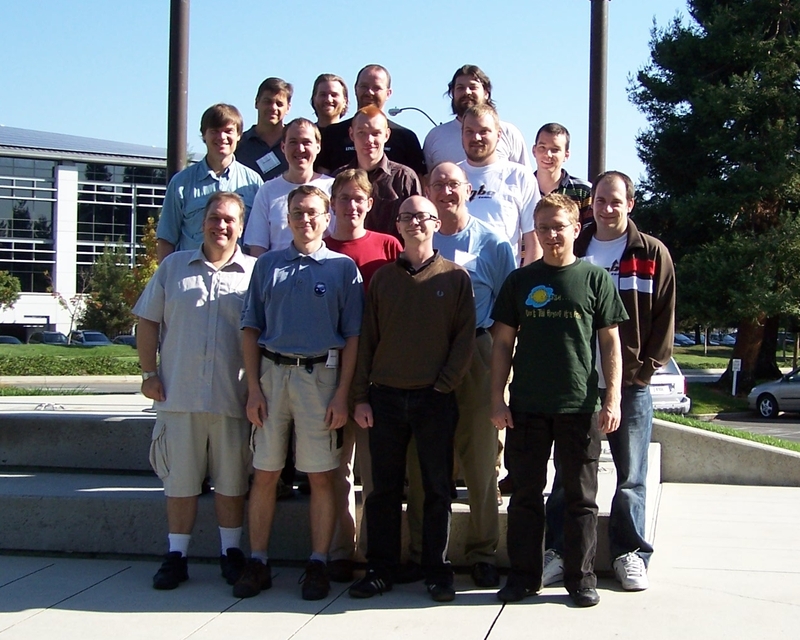 We just wrapped up our third Summer of Code, and as with 2006 we invited mentors from all successful organizations to Google for our annual Mentor Summit. We spent all day Saturday with our colleagues from the open source community sharing knowledge to improve Summer of Code, fostering collaboration and, of course, having fun! Our attendees proposed and led sessions, unconference style, from "How Do You Transfer an Itch?" to "The Stick, the Carrot and Sushi." Marty once again treated everyone to a day of free association and tinker toys in Casablanca. Here's the obligatory group photo, and as you can see we've picked up a few more friends since last year. You might also want to check out some pre and post summit pics from Bart, Seb and Wolf. Congratulations once again to all of our students and mentors for another stellar showing in Summer of Code. Keep your eye on the program blog in the coming weeks for notes from the mentor summit and more success stories from our students and mentoring organizations.